Project coordinators are the center of an organization’s project team and they must deliver building and developmental ventures of diverse sizes and complexities. They attend punter meetings where they help in determining requirements of specific projects. In addition, they help project managers to draft and issue proposals, tenders, cash flows, budgets and preliminary schedules for every project. 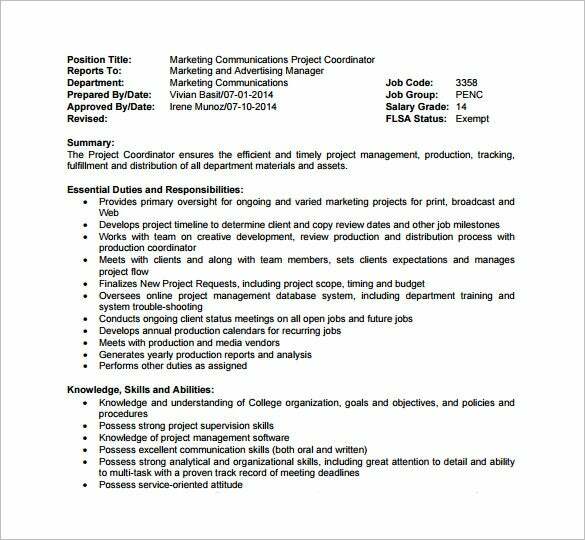 You may also like Marketing Coordinator Job Description Templates They head project meetings; distribute minutes to their team members and follow-up on the advancements as well as quality of work done by their subordinates. They effectively communicate project needs to clients and project team so that their customers are satisfied in time and at the lowest cost. You may also like Job Description Templates. 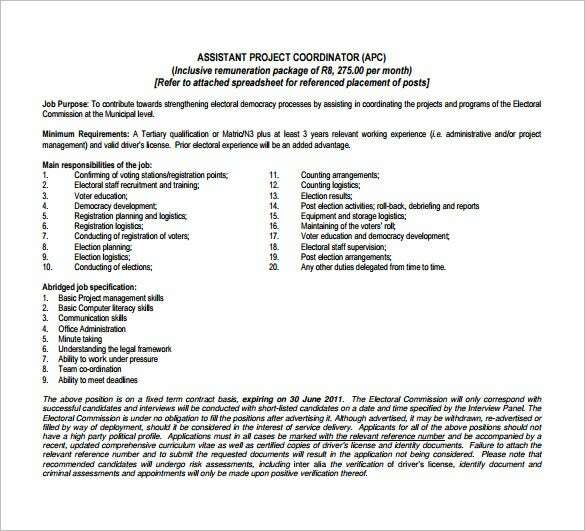 mtas.tennessee.edu | The landscape architect project coordinator job description template in PDF format can be used for posting on career pages and job boards online. 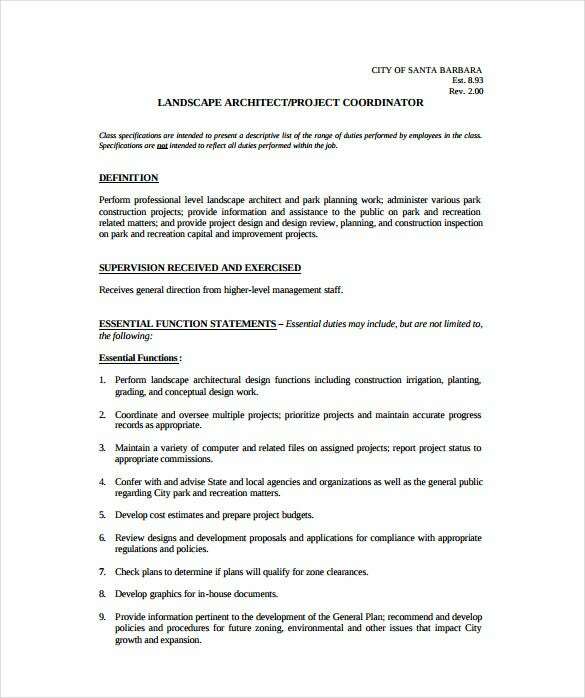 It is an easily customizable template envisaging the duties of the landscape architect project coordinator. 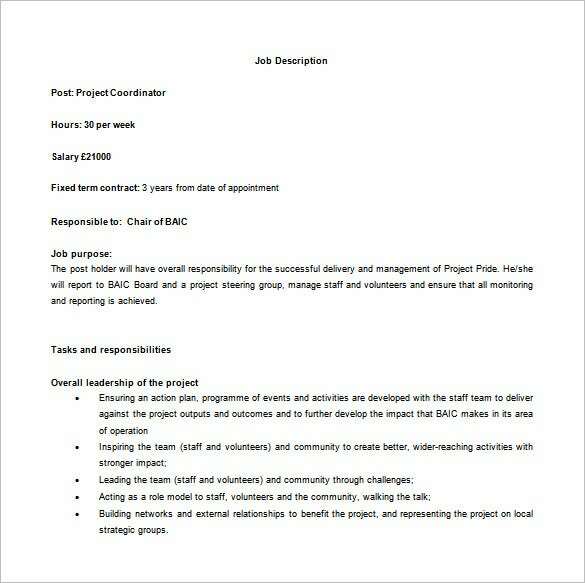 uploads.charityjob.co.uk | The project coordinator job description example template can be used as a guide for detailing the duties and the responsibilities of a project coordinator in the most professional manner. This template is easily editable. 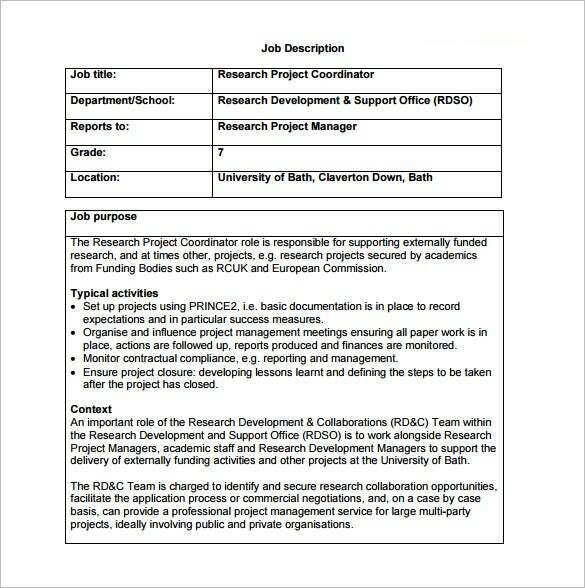 bath.ac.uk | This template can be used for detailing the expectations and requirements of the candidates who would like to work as research project coordinators within organizations. 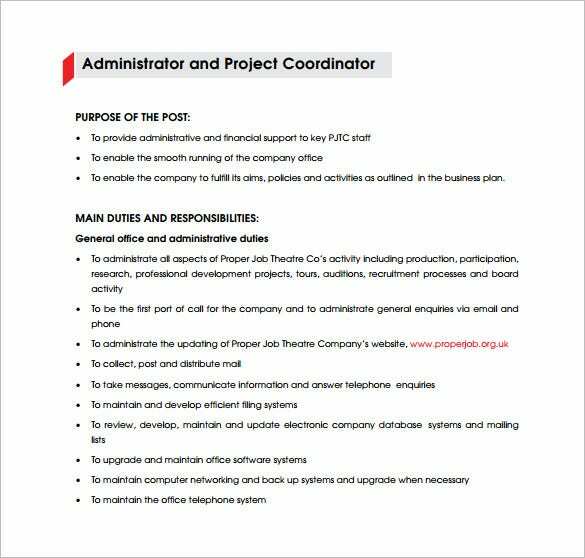 elections.org.za | The assistant project coordinator example template in PDF format details the duties and the responsibilities of an assistant project coordinator. 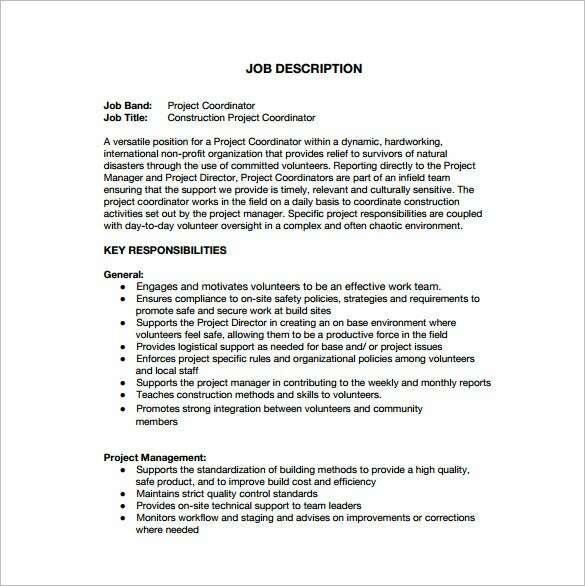 > Why Do You Need Project Coordinator Job Description Templates? Project coordinators work under the guidance of project managers and they take up the responsibility of controlling different project variables. 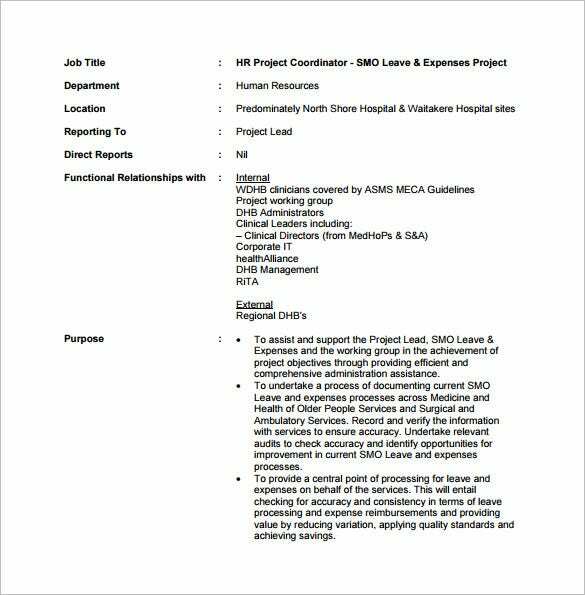 Project coordinator job description templates can be used for describing the role, the skills, the qualifications, the experience and the knowledge needed for serving at the position of a project coordinator within a company. Employers looking for suitable candidates for this position can always make the effective use of project coordinator job description templates for helping the probable candidates get an idea about the expectations of the employers. 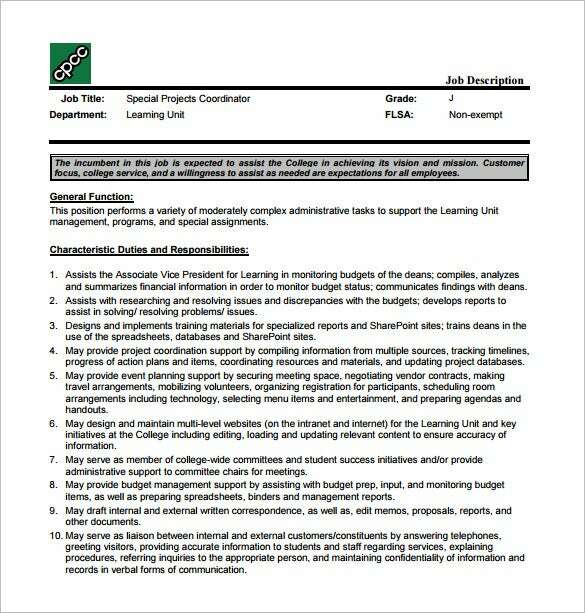 > When Do You Need Project Coordinator Job Description Templates? Project coordinators serve as the center of the project team of an organization. They are required to deliver developmental and building ventures of different complexities and sizes. Therefore, it becomes very important for the concerned companies to get hold of the best project coordinators for their companies. This is the reason why it becomes important for the companies to make use of project coordinator job description templates for detailing their expectations from candidates willing to work at this position. 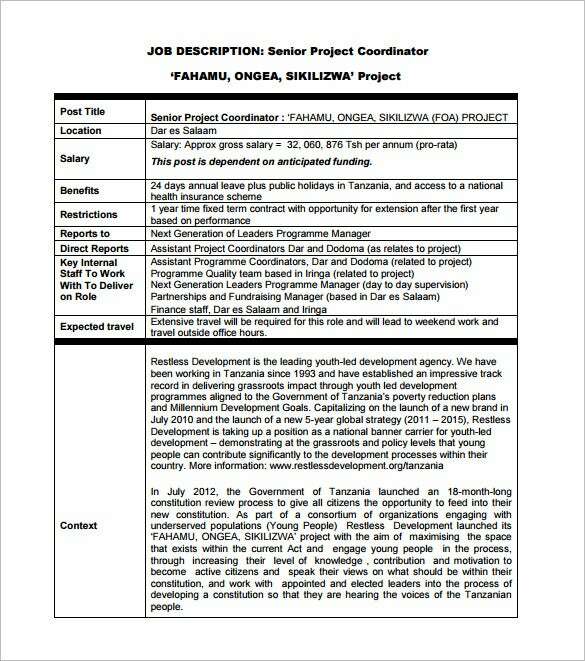 Thus, it can rightly be said that project coordinator job description templates are needed when the employers are required to make the applicants understand the qualifications and the skills that they need to possess in order to serve as project coordinators for an organization. Project coordinators carry out the job of synchronizing the different operations of a company and they are also involved in the proper completion of the different projects that the company takes up. Therefore, when creating project manager job description templates, the concerned individuals or the employers need to remain aware of the fact that they need to detail the job duties thoroughly so that there are no confusions during the later stages of employment. 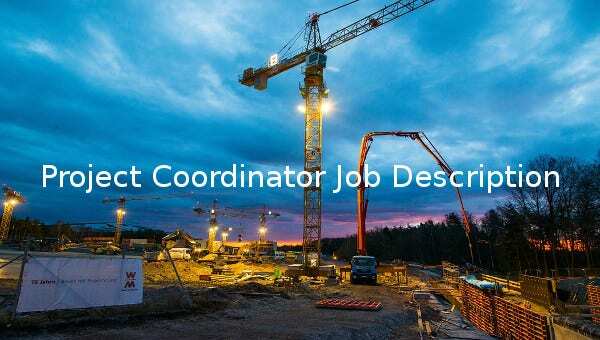 When framing the project coordinator job description, they must make it a point to use easy to understand and clear language so that the probable or the interested candidates for this job position do not have any doubts left in this regards. It is always the best idea to make use of project coordinator job description templates in order to get hold of the best and the most suitable candidates for this important job position within an organization.